Women constitute half of the world population and they own less than 1% of the world’s wealth and property. Therefore, men are sharing the remaining 99%! Even with the same qualifications, women still earn 20% less than men on average. The subject has been on the table for a while now. 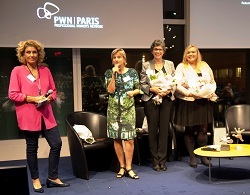 Facing a lack of data, we decided to organize a survey among the 3,500 PWN European members on “Women & Money”. We achieved an incredible return rate of 24%, expressing women’s interest. This study highlighted the biased relation between money and women, who, traditionally connected to the private sphere have no proper words to speak about money. The media coverage of the survey “Women & Money, between control and complexity” was also impressive. Further to the results of this study, we launched a development program including various workshops and interactive conferences. It provided the network with advice, shared experience and guidance from many experts: sociologists, philosophers, banking and finance experts, patrimonial and retirement professionals, hands on corporate businesswomen and entrepreneurs. As founders of the Women and Money Think Tank, we decided that the knowledge gathered was worth bigger exposure than simple words on paper. It was necessary that the workshops and study successfully run during 3 years lead to a ‘live’ product in order to address a wider audience. So, we signed the birth of the first documentary film conducted within PWN. The main target was to give our audience the opportunity to listen to the “money” experts and PWN presidents of many European City networks. They would talk to us, PWN members, who even as educated executives, don’t dare to ask for a salary raise. They would be an incentive to get the word out to women who work hard all their lives without even wondering about their value. An achievable goal? Definitely! The premiere on September 19th, 2016, was a success. The Amundi auditorium was packed with close to 250 people sitting in every possible space. Expectations were high and obviously satisfied in the light of the enthusiasm at the end of the screening that lasted during the debates and even through the discussions at the cocktail party. The words that came up most often were: relevance, good-heartedness, authenticity, impact… awakening the desire for most of us to mobilize and move forward in our relationship with money. Back to the reality of things: Money must no longer be taboo for women. Money is simply a tool to make our life projects and dreams come true. So let’s talk about it, let’s act to go further and see bigger. Today the film is a free, qualitative and efficient tool to animate and educate all the communities you belong to or connect to: professional, alumni, educational, etc.... We, women, all need to talk about money together, in our private and/or business lives, in order to become more self-confident, ambitious, audacious and dare to take risks and reach our crazy dreams! Money is our best partner to achieve them. Check out the two versions: French and international, added with the two minutes teaser.